So-called “re-blooming” daylilies give you constant color for the entire season, unlike regular daylilies. They will rest for a week or two after their spring flush, and then bloom sporadically until frost. The key to their extended season is constant expansion of the root system, since blossom production is directly tied to root growth. This is why newly planted daylilies will bloom longer; once the soil becomes exhausted they will not re-bloom. Our personal favorite, the frilly, bright lemon-yellow “Happy Returns,” represents this new generation of re-blooming daylilies. The golden yellow “Stella D’Oro” was introduced several years before Happy Returns, so it’s more common. Starting with full, compact, emerald green plants that look like ornamental grass, both varieties are covered with blooms by late May. By mid-July, re-blooming daylilies have replaced their blooms with a crop of seed pods, and the foliage is streaked with brown. Not a pretty sight. At this point in the season we recommend cutting the entire plant off at ground level, and fertilizing with Espoma Bulb-Tone or Flower Tone. This mid-season haircut and feeding makes re-bloomers bounce back stronger than ever. Healthy plants immediately put up fresh green foliage, and within a month they’ll be covered with blooms once again. 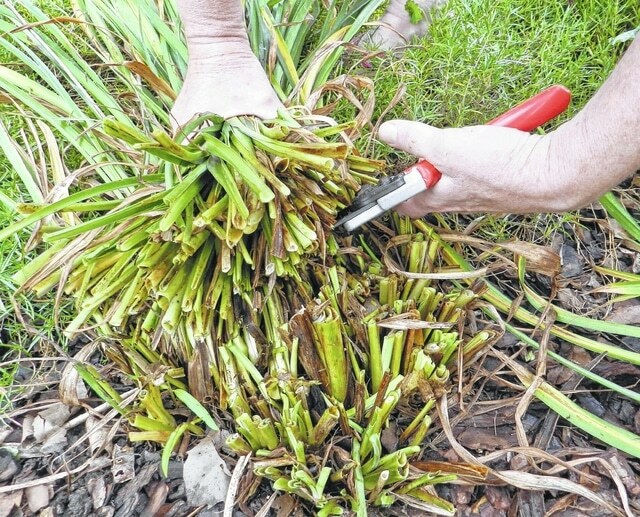 Daylily clumps become root-bound eventually, running out of fertile, loose soil to expand into. After a four or five years, you should dig the clumps up and divide them, mixing Bulb Tone or Flower Tone into the loosened soil. You can cut through the matted clumps with a bread knife or a sharp spade, or pry them apart using two digging forks back to back. When you plant daylilies (or any plant for that matter) you should dig a hole much wider than you need to, and mix a good time-release fertilizer into the soil as you refill around the plant. Bulb-Tone works best for daylilies, because it’s rich in bone meal and trace minerals that help feed healthy blooms. The better you do at planting daylilies originally, the longer you can wait before you have to divide them. Daylilies get their name from the fact that each flower bud will bloom for only one day and then wither. Healthy plants have many buds on each stalk, and multiple stalks on each plant, so they provide color for quite a long season even though each flower lasts less than 24 hours. The daylily is often called “the perfect perennial,” due to its dazzling colors, drought tolerance, hardiness, and generally carefree nature. Daylilies make a terrific ground cover on banks and under fences, crowding out weeds. Re-bloomers like “Happy Returns” and “Stella D’Oro” do a wonderful job as perennial borders. Every garden should have some. Steve Boehme and his wife Marjorie own GoodSeed Nursery & Landscape, located near Winchester, Ohio at 9736 Tri-County Highway. More information is available at www.goodseedfarm.com or call (937) 798-0239.